Newgrange is a Stone Age (Neolithic) monument in the Boyne Valley, County Meath. 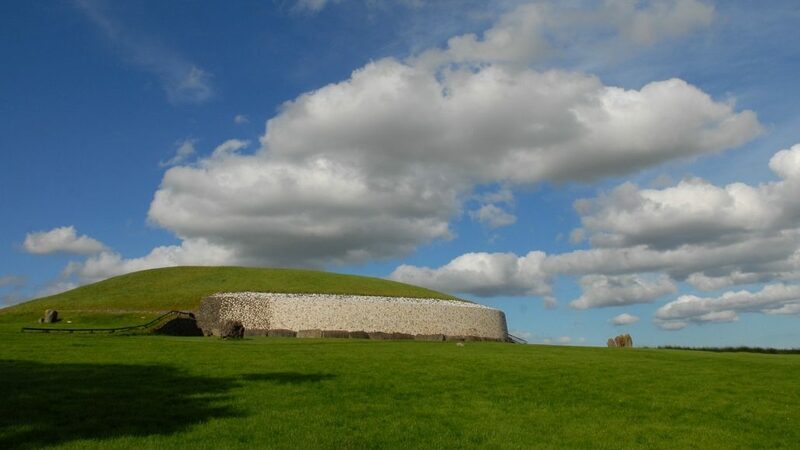 Newgrange was constructed about 5,200 years ago (3,200 B.C.) which makes it older than Stonehenge and the Great Pyramids of Giza. We’ll pick you up at your accommodation at 8:30 and go directly to Newgrange Stone Age Passage Tomb, in the Boyne Valley. From there we’ll go on to the Monastic site on the Hill of Slane and then lunch in Slane Village. After which we head to Trim Castle (location of Brave Heart!) and then on to the Hill of Tara. The Megalithic Passage Tomb at Newgrange was built about 3200 BC. The kidney shaped mound covers an area of over one acre and is surrounded by 97 kerbstones, some of which are richly decorated with megalithic art. The 19 metre long inner passage leads to a cruciform chamber with a corbelled roof. It is estimated that the construction of the Passage Tomb would have taken a work force of 300 at least 20 years.